Art that asks, "What's it like to be you?" 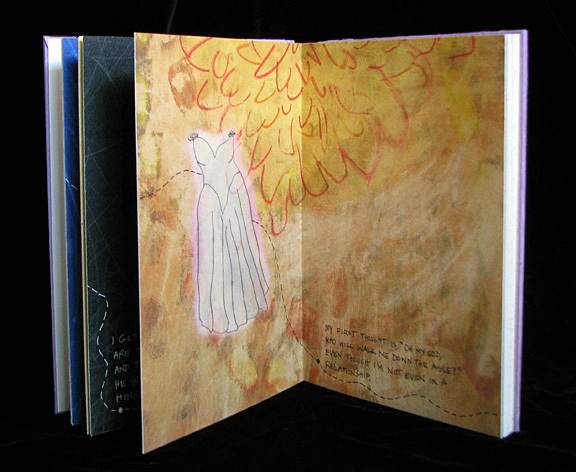 Artist books first exhibited at St. Catherine University then produced commercially and distributed by National Alliance on Mental Illness (NAMI) Minnesota. 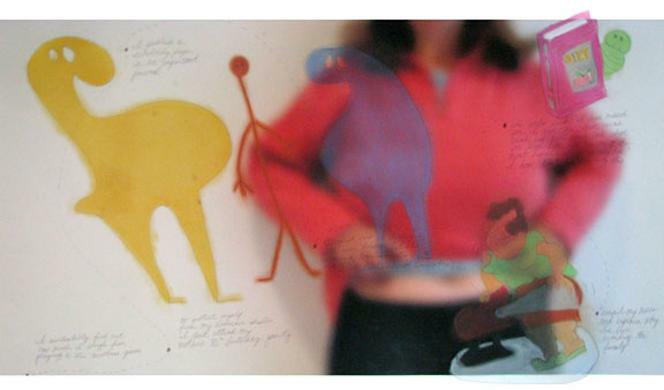 Four artist books document a family who experienced the suicide of their husband/father. 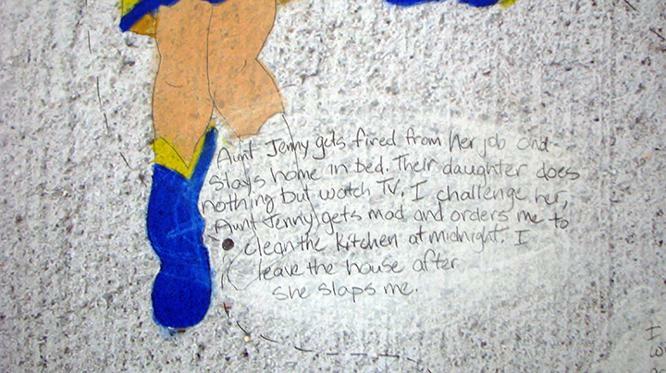 Each family member's story is told in short sentences graphed onto the page as the ups and downs of the healing process. A fifth book, Parenting the Suicide Survivors' Club, is written by the mother, Rebecca Anderson, accompanying images by Laurie Phillips. This 8’ x 4’ story portrait of a homeless teen was displayed at the Minnesota State Capitol Building for a week before a major budget vote to bring awareness to MN legislators about the importance of funding the agencies that serve homeless teens. There was an accompanying book that was hand-delivered to 50 legislators in their offices. The vote passed. Inspire Arts Gallery, Hennepin County Medical Center Hospital. Two 8’ x 4’ Story Portraits, one of a woman recovering from breast cancer, the other about a woman with an eating disorder, were shown as part of an Arts in Healthcare citywide celebration. 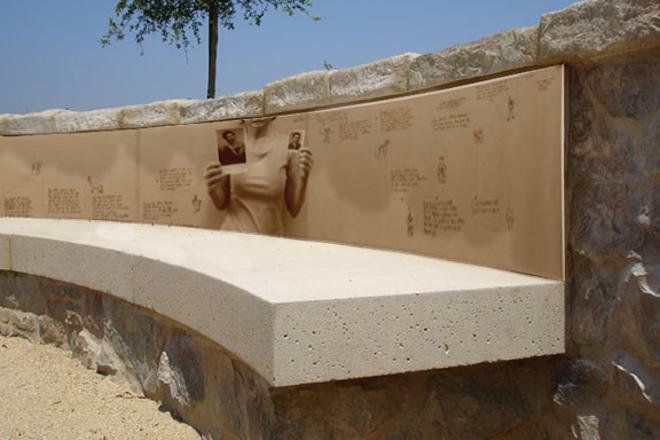 Winning this Research and Development grant resulted in understanding how to take the Story Graph Portraits out of the gallery and turn them into durable outdoor pieces using materials like laser-etched stone and digital photo-imaged ceramics. Doing outdoor installations in and around educational institutions, public parks, and health care facilities have become real possibilities in furthering a vision of using public art to help people in these institutions recognize, share, and cope with difficult emotions. It also opened up a relationship with new collaborators: architects and landscape architects. 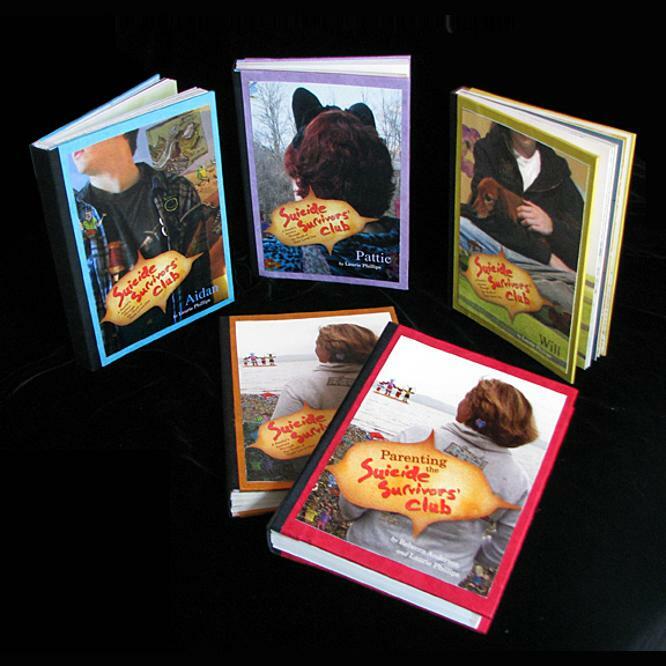 The Story Portrait Family Portrait was the precursor to the Suicide Survivors' Club books. 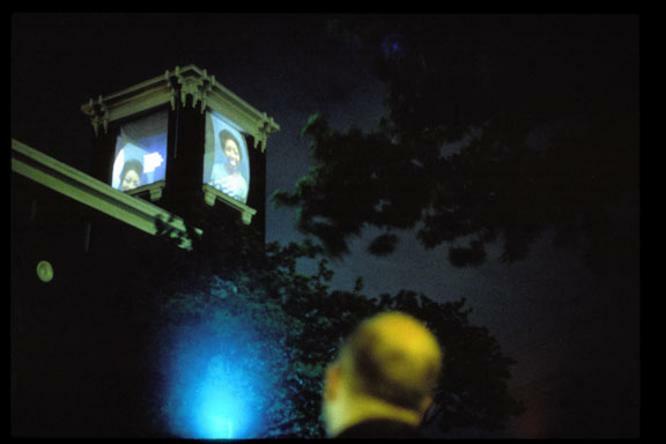 FORECAST Public Artworks grant installation at Cedar-Riverside People’s Center bell tower in Minneapolis, four hours per night for a month. A 1995 FORECAST grant allowed Laurie to spend a year at a low-income health clinic/veterinary clinic/community center, photographing and interviewing the people who use and staff the center. Portraits and quotes from them were projected onto scrims covering the large openings in the bell tower. As the wind moved the fabric in and out, the people and animals seemed to breathe. Using images and texts about the positive and negative effects of belonging to groups and communities was a gesture towards transforming a dull city block into a site of controversy, beauty, and public spirit. FORECAST Public Artworks / Jerome Foundation grant. Open Book Literary Center, Minneapolis. 9’ x 6”. Collaboration: Jon Spayde. 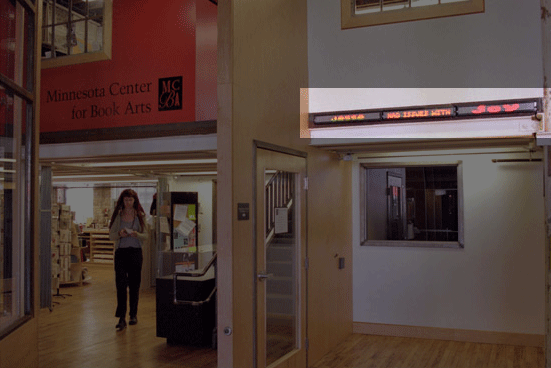 The Electronic Literature Generator is a surrealist word-art piece consisting of three LED signs displayed in a row on the wall: the first sign displaying nouns, the second displaying verbs, the third displaying more nouns. The words were solicited via a ballot box in the lobby of the Open Book center. The signs always make a sentence but the sentence is constantly changing due to the time-based graphic display. 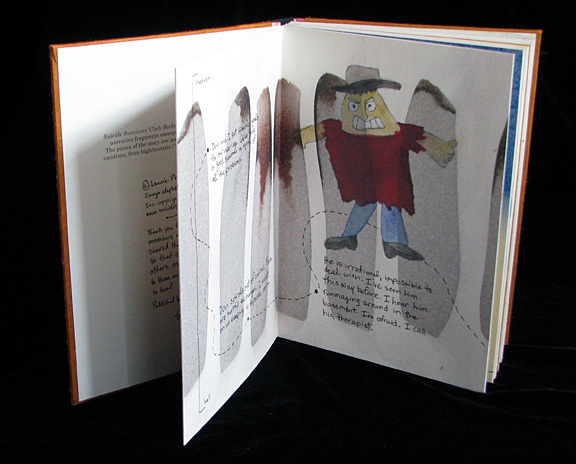 The ELG succeeded in expanding the literary sensibilities of the Open Book Literary Center into the surreal and playful. Weisman Art Museum-commissioned installation, University of Minnesota, Minneapolis. Three hours a night, July 11-13, Collaboration with Siddiqi Ray. 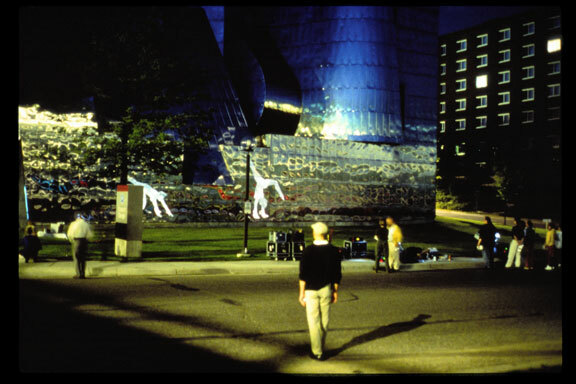 Using eight computer-driven projectors on the lawn of the University of Minnesota’s Weisman Museum, a 20-minute looped slide sequence of 24-foot-tall women made of light was projected. The models turned cartwheels, dived off the top of the museum, and clambered around the complicated aluminum facade of the eccentric Frank Gehry building. In playing over the building’s surface, the female forms were also playing with the boundary between inside and outside the museum, coming to life at night and enjoying themselves as free subjects, not art objects.